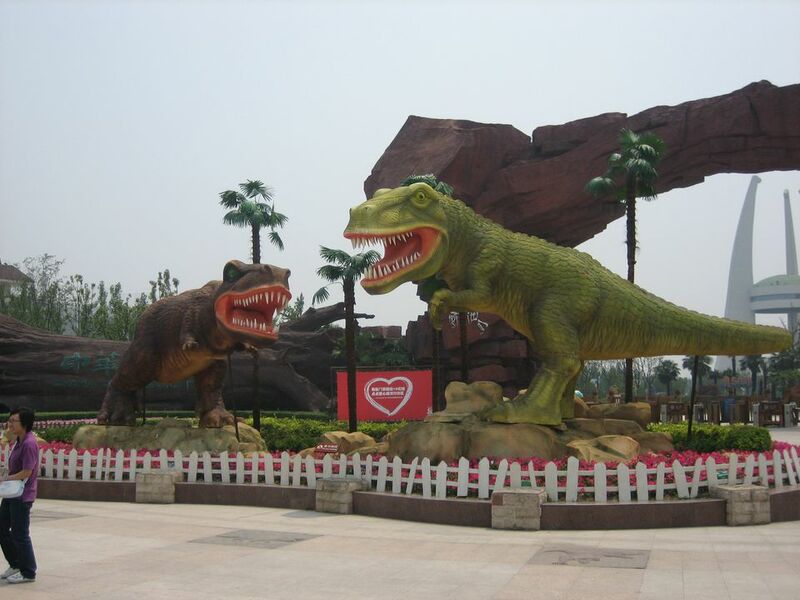 The Changzhou Dinosaur Park is a huge dinosaur themed amusement park in the city of Changzhou in the Jiangsu province of China. Changzhou is just an hour and a half outside Shanghai by train. The theme park has Six-Flags-type large-scale amusement rides, entertainment shows, a water park, playgrounds, a dinosaur museum and of course, scale replicas of dinosaurs. Say it in Chinese: "chahng joh kong long yoo-an"
The park is divided into five areas titled Lubara, Happy Street, Rain Forest Adventure, China Dinosaur Museum and Funny Dinosaur Town. These divisions are really only apparent on the map but are useful in describing what features are in the park. They are working on a development in the park's northern area where Dino-themed hot springs are supposedly going in. Area descriptions follow. Happy Street (Entrance): After you enter the main gate you'll find yourself getting oriented while bizarrely happy Disney-eque music blares from loud speakers. On your right is a large map and nearby are hand-held map-brochures you can take with you. The brochure is nominally marked in English. To your left, find electric trams where you can get a quick tour of the park. Electric scooters (1 or 2 seaters) are available for hire and so are tandem bikes. China Dinosaur Museum and Surroundings: A large three-prong tower and dome museum dominate the view inside the park. The tower holds a cinema and the dome holds some sub-par exhibits about evolution but a pretty fantastic main dinosaur hall. The exhibits are of dinosaurs from China so have names like "Yunnanosaurus" and "Szechuanosaurus". Also in the area is a splash ride that jets out of the top of the museum, a water feature with concrete "sand" and large sculptures, concessions and an animal performance hall where sea lions (live, post-Jurassic sea lions) perform 3 times a day. Lubara Theater: This section is where many of the main amusement rides are as well as bizarrely-themed pirate ships and buildings. There is a large water park here that is open in July and August that looked like it would be a lot of fun. The Lubara Theater which features the park's major entertainment attraction is located here. Rain Forest Adventure: This section is the best for little kids as it has two great playgrounds and the Dinosaur Adventure Mountain. One playground at the bottom of the "mountain" features an obstacle course of climbing structures made from rope and wood. The other one is a giant pirate boat. The Adventure Mountain feature is a set of winding paths around the "mountain" where you can search for dinosaurs hiding in the bushes. The "Adventure Dinosaur Island" stage performance happens daily at 1:30. It features fake guns and rockets and men in military garb. It's very loud and probably not appropriate for little kids.